find the new thread here! Last edited by tubla on Sat Jan 06, 2018 4:51 am, edited 214 times in total. 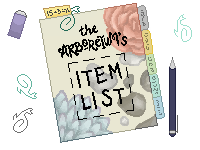 Re: ❧ The Arboretum: Terrariums! This is not a species adoptable. We do not have a lineart with traits, only plants, decor, and animals. thread. If anything is confusing, don't hesitate to ask! You can PM me, the mods, or post your question. It's an empty jar. Are you going to do anything with it? jar is up to you, and each person will always end up with a different jar. Who knows, maybe you'll get an entire collection someday? Last edited by tubla on Sat Jan 06, 2018 4:50 am, edited 60 times in total. More detailed instructions, for those who are interested. Unlike the species adoptables going around, this is a pixel store for anything plant related: terrariums, gardens, or flower arrangements. You have complete control over what you would like in your jar, and they make lovely decorations for your signature or trade rules! Great! How do I get one? First, head over to our item list. It's a catalog with everything we have to offer on it. It has a couple of tabs, at the top (some mobile devices), or at the bottom. Simply click the tab to move to its corresponding sheet. Don't worry about the lock sign! If it's your first time, I'd definitely suggest looking around first. Sea glass [ ] is the currency we use here. All prices on the item list are in sea glass. If you'll need some for your jar, please check the conversion rates. After familiarizing yourself, you'll need to order the jar! You can send an order in when you're ready. The form is a multi purpose form, just ask if you're not sure what section to use. The form should take you through what you need to do. If you've sent in an order, please post here saying so! This will let me know when to check through the orders, and also means that someone else isn't getting something with your sea glass. We'll assemble it for you, just is come back in a couple of days to pick it up! Complete orders will be posted here. I don't do scheduled code drops, make sure to check back regularly. The first thing to do is pick out a jar. It's the base of your terrarium. All the jars we currently have available are listed in the first section on the "Main List" tab. Once you're done, pick out a substrate! scroll down to the substrates section to choose! I'm going with dark pebbles. once you're done. Remember to include the cost of the jar! Please make sure to use the full name of the item. Submit the form with your instructions (see fAQ), post on this thread, and you're done! any discrepancies you will be notified. Come back in a couple of days for the code drop! How do I get customs? Check the "special item store" post for more details. Last edited by tubla on Mon Jul 03, 2017 6:33 pm, edited 21 times in total. The list of discovered and available things from jars to their contents. For examples of jars, check the archives! This link leads to a Google Sheets document. Want a jar? Simply fill out the form below! This link leads to a (Google) form. We're COPPA friendly! code drops, so make sure to check back regularly! Last edited by tubla on Mon May 15, 2017 10:50 pm, edited 123 times in total. Here, our currency is , or sea glass (sg). It's obtained by trading in pets, C$, or items. You may use it to purchase extra and cooler stuff! If you are COPPA'd, please send a suggestion with no message. Strikes will be given out for every second offence! If you break them once, you'll get a warning. ☛ No more than 5 common and below pets at once. ☞ You're allowed to give up to 3 duplicates in the trade. (that you're giving me, not which pets I have or not). ☛ No more than 25 pets at once (no limit on C$). Please don't send multiple trades to get around the cap! ☞ If it is not on any of the lists below, I don't accept it! Also, please try and calculate the amount yourself and include it in the trade message. Prices here do not include demand, which will give you a bonus! if it isn't here, then use the normal chart. *negotiable, since demand plays in a lot! Last edited by tubla on Sun Nov 05, 2017 8:14 pm, edited 709 times in total. Free completed jar giveaways! Have a suggestion for a theme? Head here! Sometimes I have arrangement ideas, but I can't give myself a more jars. If you ever run out of ideas or think that your jars always turn out bad, you might be able to snag one off of here! These are completely free, and do not have a set schedule as these are things that I do for fun. Occasionally they might even feature special "unreleased" items, or more expensive than average jars. Because of that, the entry forms for these jars are slightly lengthier/might be different than others, and I'll be more picky with them. If you include more sections/reason(s) why you like the jar (especially if it was made by someone else), you will be marked up! *You may add in more sections if you'd like, but don't delete anything, please. Last edited by tubla on Sat Sep 09, 2017 10:17 pm, edited 140 times in total. Last edited by tubla on Sat Jan 06, 2018 4:23 am, edited 134 times in total. Last edited by tubla on Sat Jan 06, 2018 4:22 am, edited 126 times in total. ☛ Can we be affiliates/can I be a mod/artist? ☞ Can I use my jar as my avatar/put the images in a signature rotator/url shortener? Avatar: I would prefer if you didn't, but if you do, please have a link to this thread in your signature. Signature rotators and url shorteners are fine as long as they link back here. ☛ What is the average cost for a jar? Paid jars are usually between 150-300sg. They very rarely go above that. ☞ Do the plants die over time? ☛ How do I get customs? I very rarely give them away, but you can purchase them. Please check the "special item store" post! ☞ If I want a colour change, what do I do? Some items can be changed into different colours. If you don't want it changed, don't specify any colour, or say "original colour". You can either give me a hex code, general colour (the most risky! ), or use the colour of an item ("the same colour as x item"). Hex codes/RGB values are the most safe as you can give me a specific colour. If you don't know how to get one, I suggest using this website! You can also check the special item store for how to re-colour other items! ☛ How do I make my placement instructions better? If your jars have been turning out like you imagined them, you're set! c: If not, here are a few tips that let me understand a little better. Hopefully these will save you from paying for edits. - For each item: include the full item name: the one on the spreadsheet; any edits, if there are any; where it is in the jar and/or to items near it, and if it's in the foreground/background. Please don't assume that I know where you want something! the statue, mushroom, and agave. the left and which is on the right? very front to the right of the statue. Items in use: Antler, whale statue, lauii, minima succulent, burgundy roses, purple echeveria, and paper crane. Paper crane goes outside and right of the jar. Everything else goes inside. Minima at far back, far right. Antler in front of minima. In front of the antler, the whale statue is to the very right. The lauii is to the left of the whale, covering the round end of the antler. Burgundy roses are centered in front and between the lauii and whale. The echeveria is in front and to the right of the roses. Last edited by tubla on Sat Sep 09, 2017 10:49 pm, edited 37 times in total. Feeling supportive? Here are some free to use stamps! If you would like to make one, simply post it on the thread. You will get credit! There's another vivarium store: Ant Farms, run by fuiuki. If you like ants/are too scared to look at them in real life/like the sort of things you can get here, check it out and give them some support! Alternatively, check out the Vivarium Store Chain Index. It's a collection of shops that have similar concepts to this one. Last edited by tubla on Mon May 15, 2017 11:04 pm, edited 23 times in total.